In much of the German author W. G. Sebald’s shadowy fiction, photographs appear like phantasmagoric guides, leading protagonists and readers alike into a dream state where the quest for narrative meaning is subsumed by the disruption of the image in the text. Wittgenstein’s eyes appear with as minimal explanation as the the picture of an isolated beach or the quiet, cavernous insides of an Austrian train station. For Sebald, these photographs are as random as our recollections, and become archives of a more “authentic” kind of narrative—one in which the self-in-time is represented through the act of purposeful and shapeshifting memory-making. 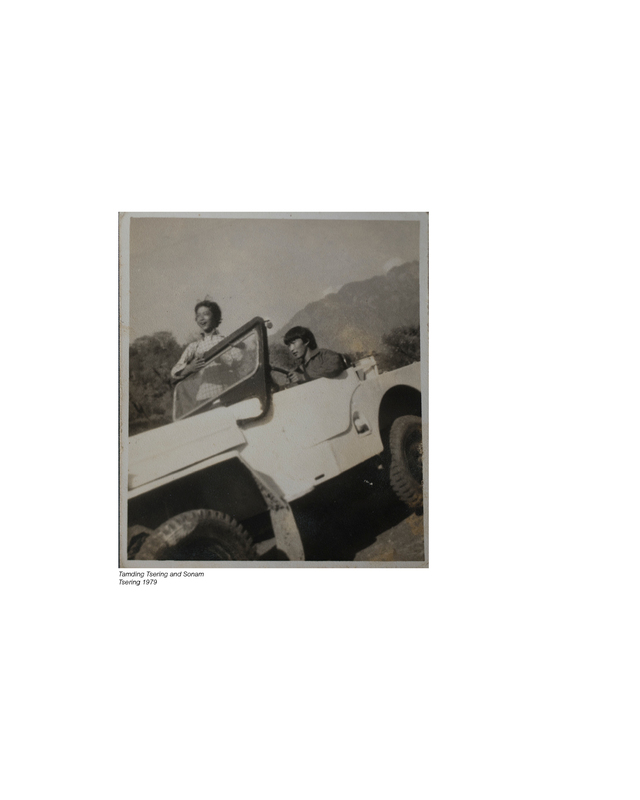 These works, though explicitly fictional and self-aware in their methods nonetheless bring us to question the ways in which we build trajectories and networks through the memories of our own lives and employ photographs to fortify them. How does the history of the world play into the remembrance of the individual? Can we ever be certain that our recollections are truly our own? 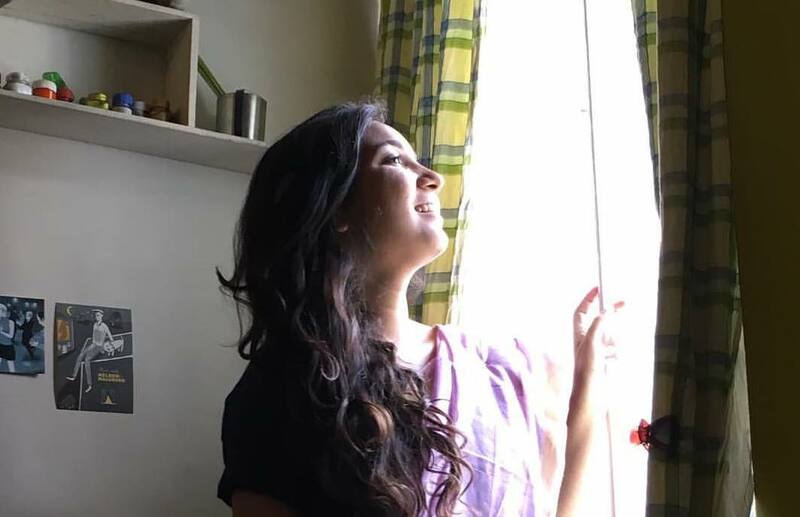 For this week’s Post, Kirti Kumari, a photography student at the National Institute of Design in Gandhinagar, explores some of these themes in Sebaldian fashion. 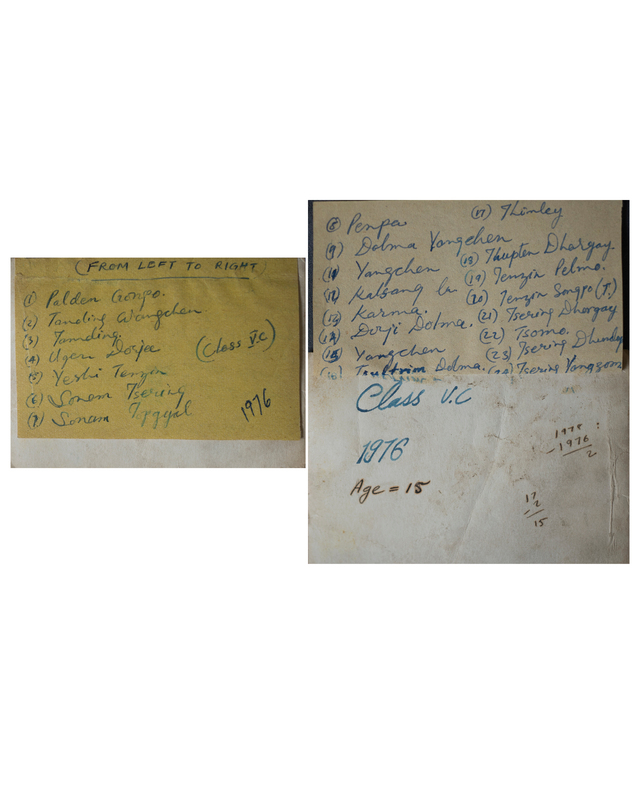 Following the life of Sonam Tsering, a Tibetan teacher and archivist, Kirti looks through his meticulously recorded collection of photographs documenting his childhood days in Himachal Pradesh, after fleeing persecution in his native Tibet. Sonam’s images may not be wholly remarkable in and of themselves; in fact, they might look like many of our own: tinted, fraying at the edges, visible folds and blemishes. But what they do offer is a mirror to memory-making, self-documentation, and the narratavisation of life that we are all bound to practice. Through this sinuous viewing, Sonam’s photographs complicate the idea of nostalgia. The memories of my meetings with Sonam Tsering come back to me often. I instantly start reliving the cold days of June, his damp room behind the Dal Lake, the unannounced rainy days, and conversations over cigarettes and bidis in the mountains of McLeod Ganj in Himachal Pradesh. Before my first meeting with him, my sense of direction failed me and I lost my way to his house, but patiently he guided me over the phone in his kind voice, waiting for me by the end of the main street. We then took a silent walk together to where he lives now. Even the terrain seemed to be familiar with his firm walk, he was was so well-acquainted with the ditches and creeks. He appeared to me like a monk, and looked much younger than his age, with neatly-tied, long grey hair and a glowing face. Now fifty-seven, he has always lived alone in the mountains shifting from address to address. Sonam Tsering’s parents fled with him to India from Tibet during the Chinese invasion, when he was still an infant, making a torturous journey with thousands of others through a long escape route on foot across the Himalayas. The Tibetan resistance came to a head on 10th March, 1959 when hundreds of thousands of Tibetans surrounded the Potala Palace in Lhasa fearing the Dalai Lama was about to be kidnapped or assassinated. The uprising was brutally suppressed and the Dalai Lama, then 23, was forced into exile, with thousands of Tibetans following him. Sonam’s parents worked on road-construction sites in Kullu Manali, along the Himalayan range of North India, with many other refugees. Sonam attended the Upper Tibetan Children’s Village School (UTCV) in Dharamshala till the tenth grade, after which he moved to Varanasi, where he studied the Tibetan language. After he completed his studies, he began to teach Tibetan to other children in exile both in India and Pokhara, Nepal. As a teacher, he continues to contribute towards preserving Tibetan identity and passing on sacred knowledge and the spiritual and cultural traditions of Tibet. He recently quit his job as an archivist at the Library of Tibetan Works and Archives (LTWA) in Dharamshala, where he had been working for the past eight years. Sonam lives an unhurried life; he believes in a sustainable lifestyle with basic necessities, a minimal approach that connects him to his homeland and its Buddhist teachings. Around his calm and articulate thinking, the clutter of my own mind started clearing away. 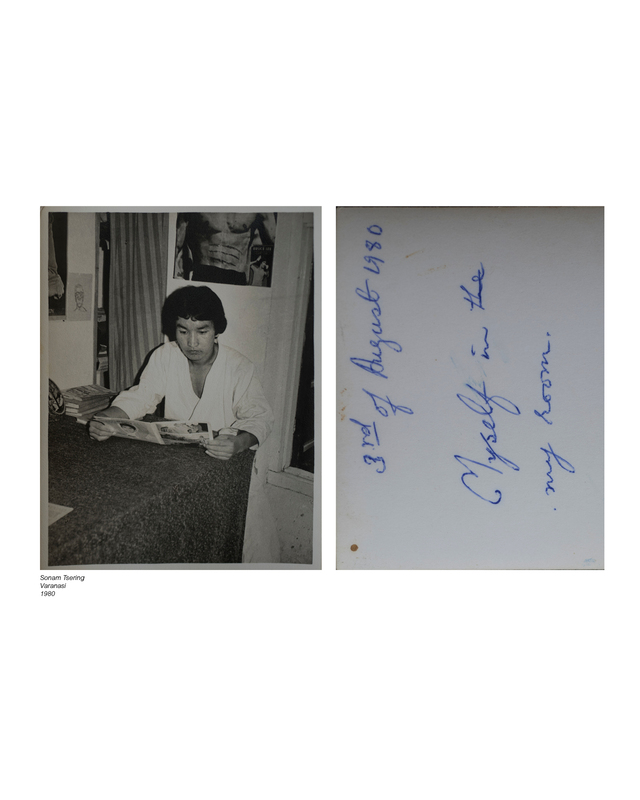 He considers his books and his photographs, in particular, to be his most valued possessions. He bought his first camera, a medium-format Agfa Click III, when he was still in the fifth grade, having saved money for over two to three years. As he joined the school when it was still under construction, Sonam, along with other students, would often carry construction materials from the mountains and walk a long way back to the site to earn some money. Almost like a character from a Ruskin Bond novel, he hid the money in the forests under trees to avoid being caught by school authorities, and when he finally had enough, he bought himself the camera. I can almost feel his joy when he describes how he felt to hear the shutter for the first time, the sound of his first photograph. Although he never took it up as a serious profession, photography for Sonam is a process, an artistic, technical, and craftsman-like expedition. He has made an exemplary coordination between his art and life, the vestiges of which are all well preserved in words through multiple travel and personal journals, negatives, exposure records, photographic prints, and collected objects. His collection of photographs are self-sustaining archives in which each image reads like a haiku from his life. The photographs here are from his personal albums, where he has been photographed by others. 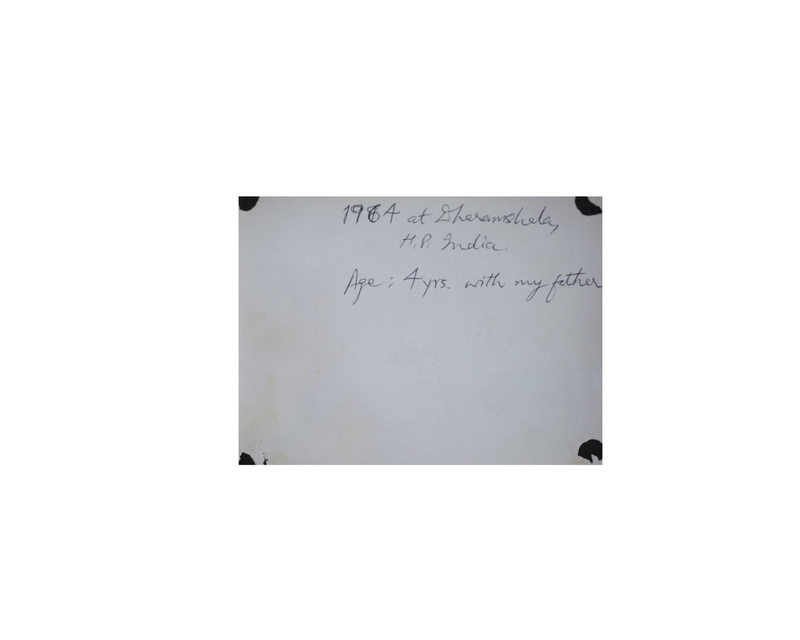 Sonam’s method of archiving strives to fortify the images, saving them from nothingness. He notes down the details of every photograph meticulously—the when, where, and with whom the photograph was made, are all recorded. He has also experimented extensively with his own photographs and never let go of his less fruitful efforts. On seeing his collection, I felt a deep need to slow down; the thought of a single photograph could stay with me for days. 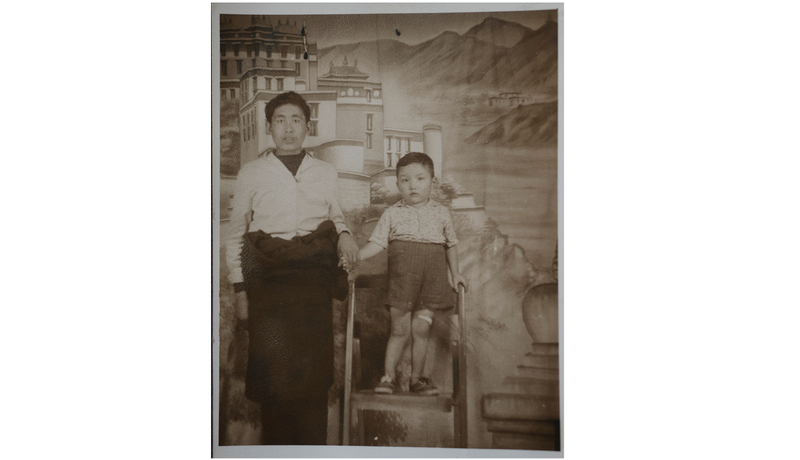 Sonam Tsering’s oldest picture is one of him with his father, taken in 1964 at a studio in Dharamshala. The photographer made him stand on a stool alongside his father in an attempt to match their heights. A part of the Potala Palace in Lhasa becomes their backdrop image, suggesting a dual sense of distance from their land and perhaps the closest they might be able to bring themselves to it. 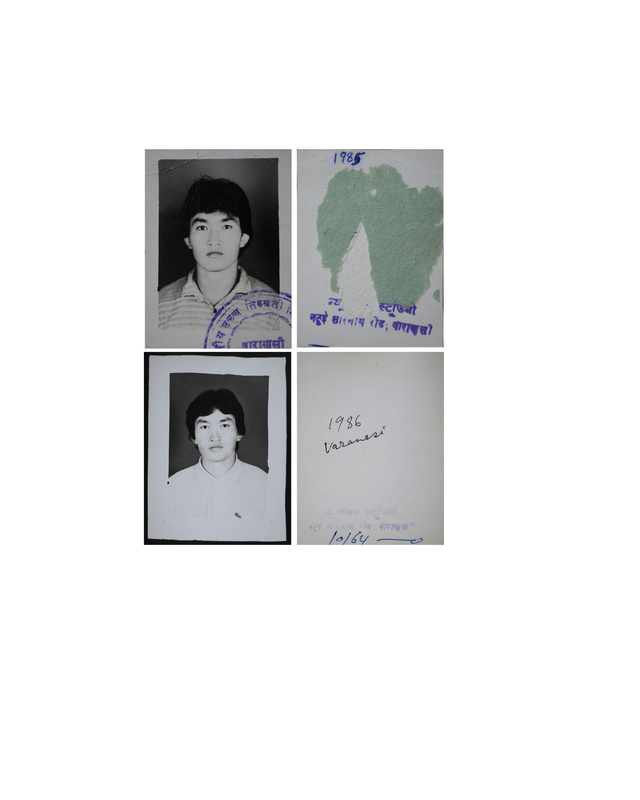 This is also Sonam Tsering’s first photograph of himself. In these images of the early Dharamsala and Varanasi days, we can identify Sonam’s interests in karate, singing, sports, etc. We also come across many faces that repeat themselves through Sonam’s life and in a way, become passers-by to the memories of these people as well, moments from all these lives appear to us like flowers pressed between pages years ago. 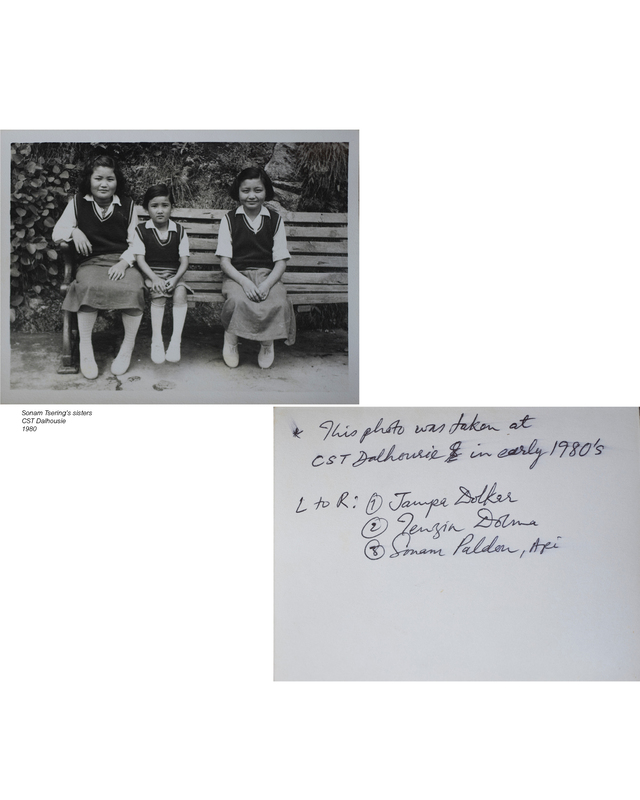 Looking deeper into these photographs, we are also peering into the lives of many other migrant children and their living conditions, children whose families were striving towards a fulfilling life on foreign soil, as exiles longing for their homeland. This search for identity and permanence goes beyond the temporal and geographical, and enters a deeply internal, psychological suffering—a nostalgia without memory, remembering a home one can never fully know. Community memory thus plays an important role in an imagined or re-imagined homeland, created as a common aim for all. The older generation of exiles remember Tibet as the homeland where they grew up, while the younger generation envisions it as a kind of utopia, which subsequently might become a myth itself. 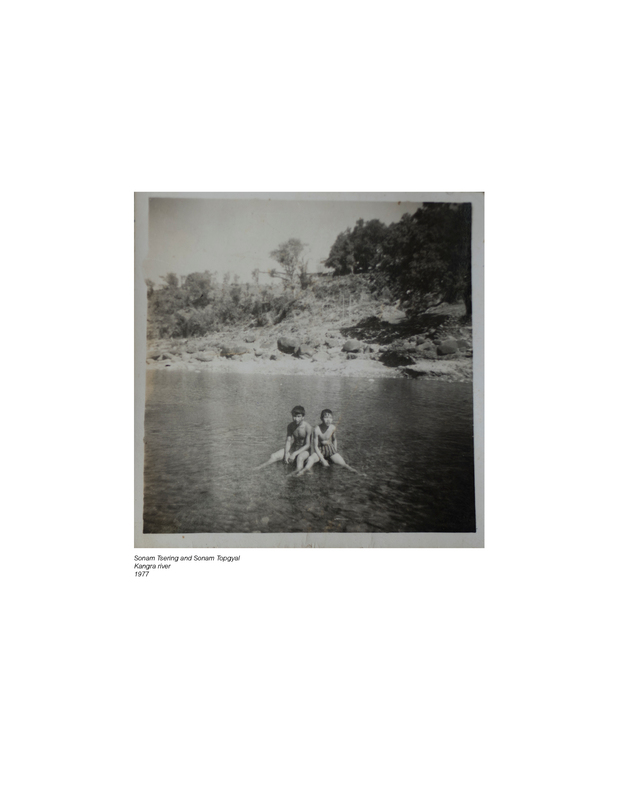 Sonam’s photographs, a stream of personal cultural history, can be imagined in a Tibet of an alternative reality; one of the memories that Sonam recalls lucidly is captured in a photo from his summer holidays, with his friend Sonam Topgyal by a river in Kangra (Himachal Pradesh), an image that almost looks like it could have been in Tibet. All his photographs seem to show us a corner of Tibet and how the day-to-day life of an ordinary Tibetan could have been. But none of them were actually made in Tibet. The words which accompany the photographs will always reveal their origins and shatter our version of an alternate Tibetan reality, his images always burdened with the history of exile. 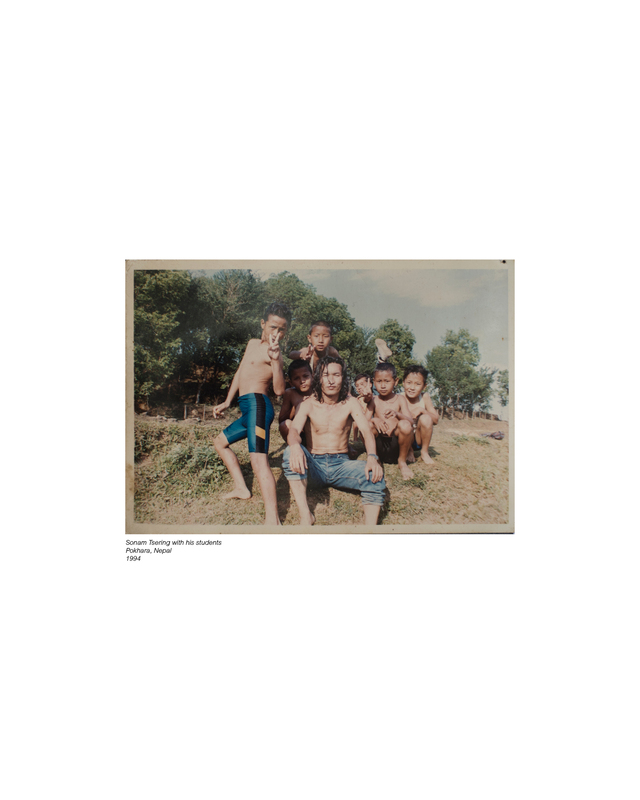 Sonam’s photographs thus form a sparse yet intricately complex narrative around the defining role that conflict has played for his generation of Tibetans. 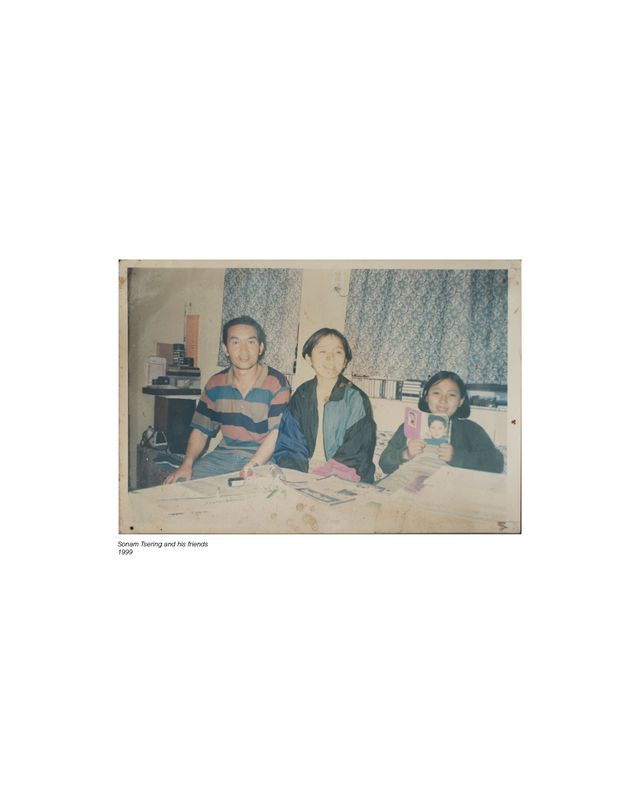 Life in its various manifestations is weighed, considered, and celebrated in Sonam Tsering’s photographs. He has managed to give us both momentary and long-term glimpses into the people and places of his time through yellow-tinted images. 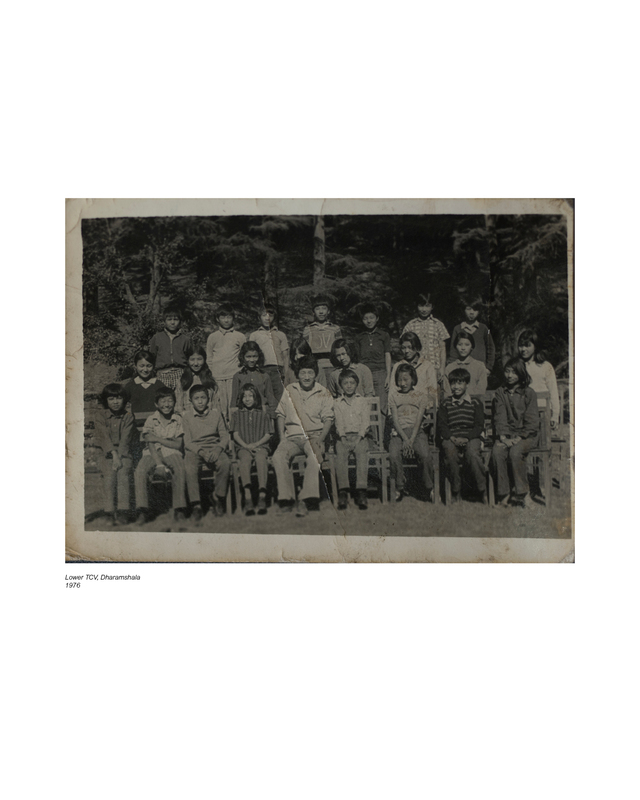 Sonam’s photographs set me down a path of recollection as I start wandering back into the ruins of my own memories, particularly the schooldays when we were photographed in groups with our classmates. From the excitement of preparing myself for the day of the photograph to the almost unendurable wait to see the final image and the joy of receiving my copy, I found myself reliving these moments through Sonam’s images, altering and augmenting them in my mind, always in awe of their simplicity. The burden of these ephemeral moments, or perhaps the personal fear of losing them, slowly recedes. While Sonam’s photographs may be digitally preserved and reproduced, the original moment itself will never reoccur, the light or the air will never be the same again. Even the simplest memory comes to us in clusters, and sometimes we seek refuge in the recollections of others, in this case, through their photographs, and a version of events that seem more authentic than our own. These photographs represent the ambiguity of memory. Kirti Kumari is a Master of Design student in photography at the National Institute of Design in Gandhinagar. She was born and raised in Kanpur.